3.Two types of Installation, The air vent mount and suction mount, Choose whatever you like. 【Buckle-Slip Design】- Never worry about your phone fall down when you are driving.This buckle can charge your phone while in bumpy journey. 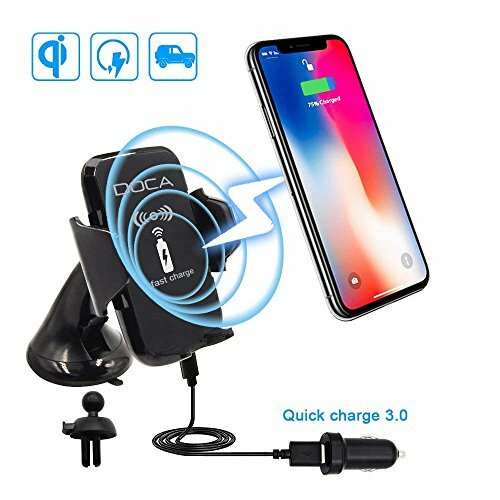 【Updated Version】- Magnetic charge tech will bring heat issue.But this updated wireless charging car mount will reduce the hot problem when the phone charge. 【3 In 1 Function】- Works as a charger or phone holder,it is also an air vent mount and a suction mount. Very Firmly mounted on instrument panel / air conditioning outlet / Desktop, providing flexible viewing angles with the 360 ° rotating ball joint on both mounts. 【Two Charge Modes】- The standard wireless charging for iPhone X, 8/8plus. Fast wireless charge 1.4 times faster than standard wireless charger. Fast Charging are ONLY available for the Samsung Galaxy Note 8, Note 5, Galaxy S6 Edge+, Galaxy S7, S7 Edge, S8, S8 Plus models. 【12 Month Guarantee】- 1 year worry-free return warranty and lifetime friendly service, easy-to-reach support to target 100% customer satisfaction.